This is SO exciting! You know how much I love giving you chances to win free things, right? Well this one is a doozy. I have teamed up with T-fal and Cookingplanit and 49 other bloggers to give away, not just 1, but 50 sets of T-fal cookware! Oh yea, you read it right, you have a chance, oh wait....you have 50 chances to win! Get a look at this beautiful cookware! We will all be running a one week giveaway, for a set of these gorgeous pans. $2.99. (android version is promised soon!) This registration, that is completely free WILL be a requirement for your chance to win! Take a minute and check out these other bloggers, and take advantage of their great recipes, and more chances to win! You will see the beginning and ending dates of their giveaways in the first column! Now, run, don't walk, and get ready to read great reviews of this cookware, and website along with great recipes! The fine print: Open to US citizens only. Limit 1 winner per household. 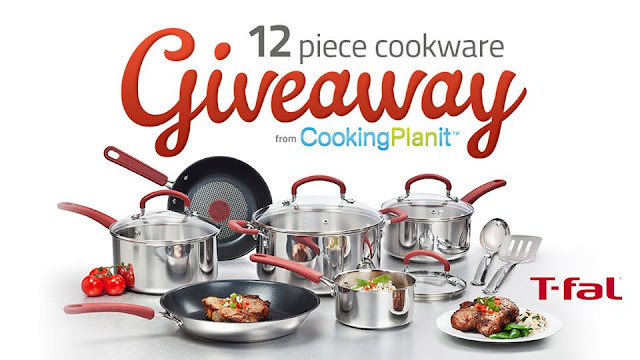 If you win on multiple contests you will receive only one set of cookware and an alternate winner will be chosen to receive your other sets. I have received a set of cookware that I have agreed to review for T-fal and agreed to promote Cookingplanit.com. These reviews are my own, and are completely uninfluenced by either company.